We had an eventful Easter this year. 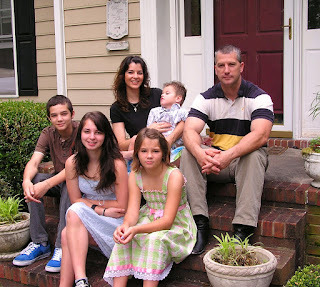 A rarity: The whole family! One of Ian's friends stayed the weekend with us. And after doing all the normal Easter things: dying eggs, church, baskets, lunch, etc... the boys and one of my girls (Shawn, Ian, Chase and Rylie) wanted to go dirt bike riding and 4-wheeling in the woods for a while. We delayed the Easter egg hunt until they got back. But, they never really got back. Ian and Chase not smiling for me. Before the whoopsie in the woods. Shawn had a minor accident in the woods, way back in the woods, and by the time we got the bikes out, him out and back to the house, the day was shot. And to top it all off, Shawn had to go to the ER because he had three good size gashes in his right knee that needed sewing up and he was pretty loopy. Actually, really loopy. Ewww. The ball is squishy and feels weird. Oooh, Is that my basket? After this photo and that grin, he smacked it off into the floor. 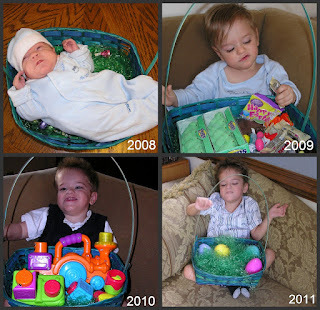 Every year I post the comparison photos of Liam with his original basket that he could lay in his first Easter home. It's amazing to see how little he was and look at that basket knowing he fit inside it that first year. Well, even after all the hoopla it was a pretty fun Easter. Memorable for sure.